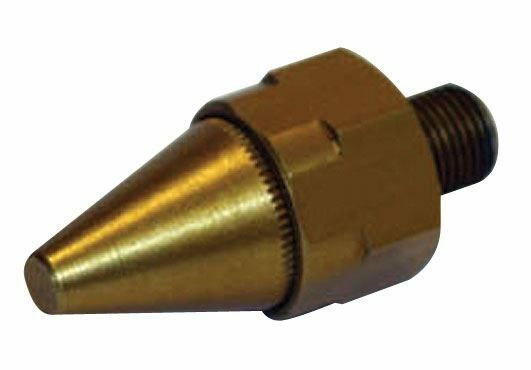 The Airmiser uses a series of annular nozzles instead of a single hole to create a safer, more efficient, lower noise alternative to open tubes and pipes. A small volume of compressed air is amplified up to 25 times by utilising the Coanda effect to induce a higher flow of ambient air into the air stream. Because of the risk of serious injury from compressed air entering the bloodstream from single open pipes at high pressure, the multi-nozzle arrangement of the airmiser is designed to be much safer alternative. Replacing open jets with airmisers will give significantly reduced air consumption and lower noise levels and in most cases it is a simple operation to install airmiser nozzles. Airmisers are suitable for use individually or in multiple arrays to create a much greater effect. No moving parts - means the airmiser is maintenance free. Low air consumption means significantly lower running costs than open holes and pipes. Quieter operation (below 80 DB (A) at 1m) for an improved working environment.